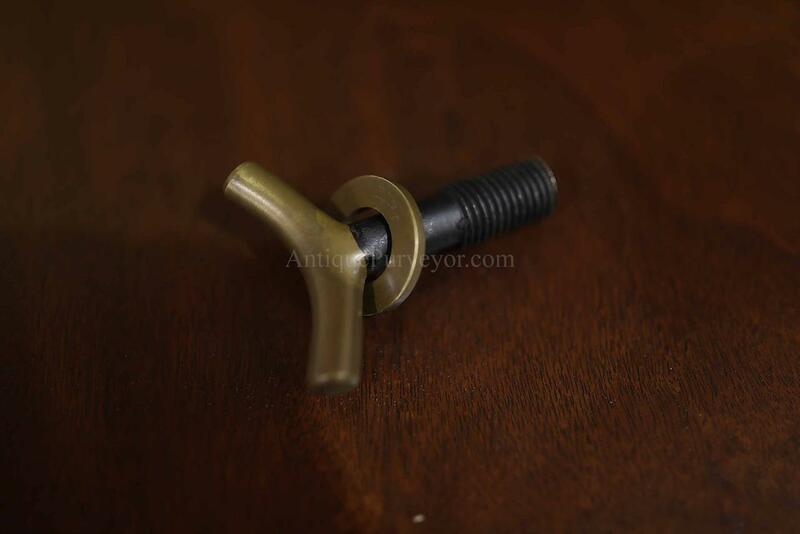 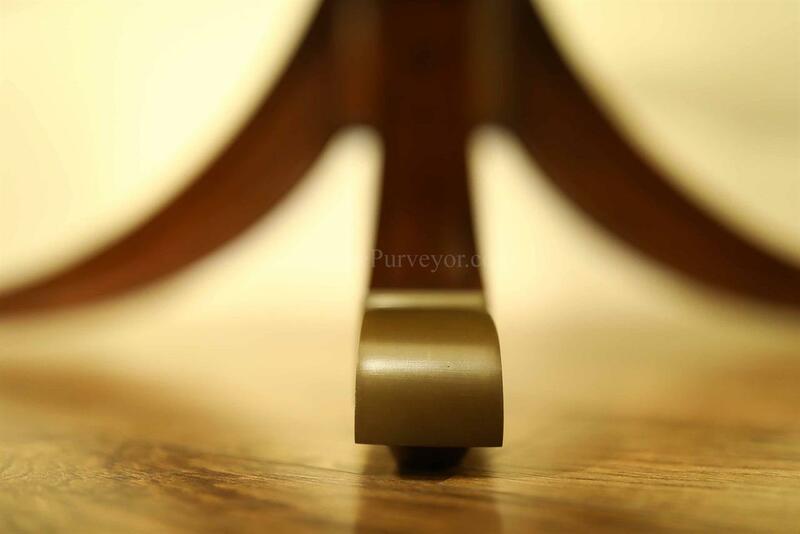 Each foot is capped with heavy solid brass feet and each foot has an adjustable level. 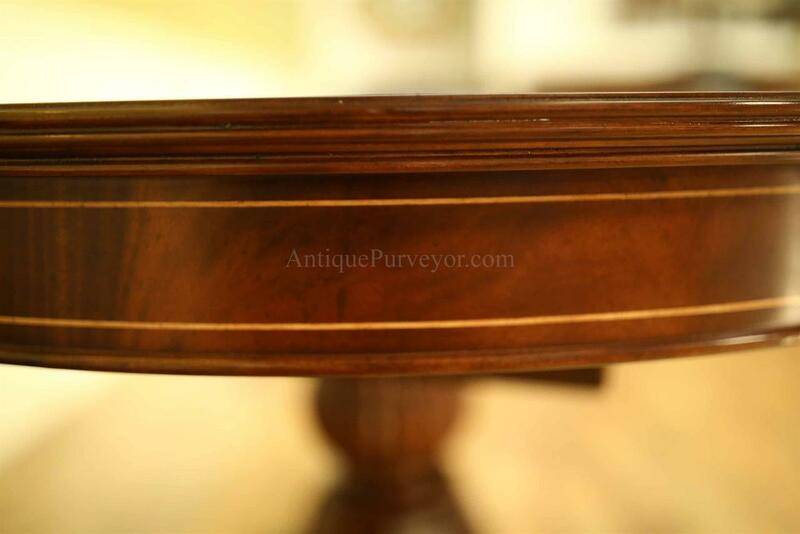 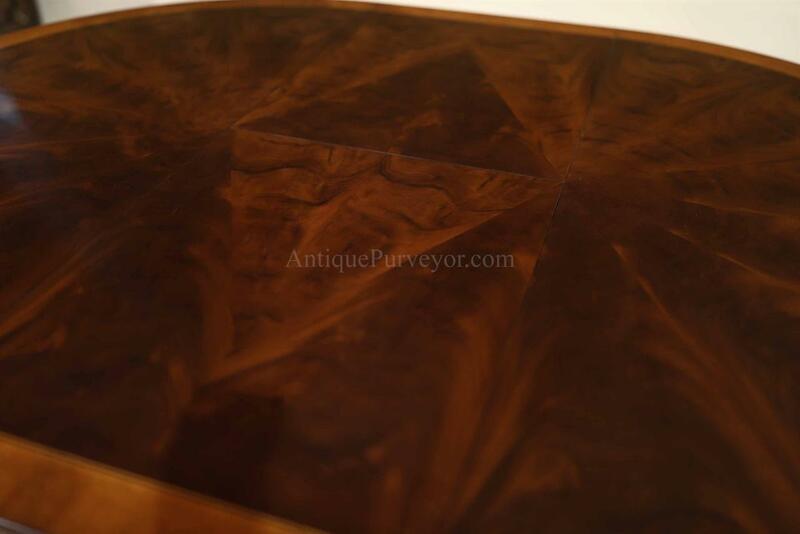 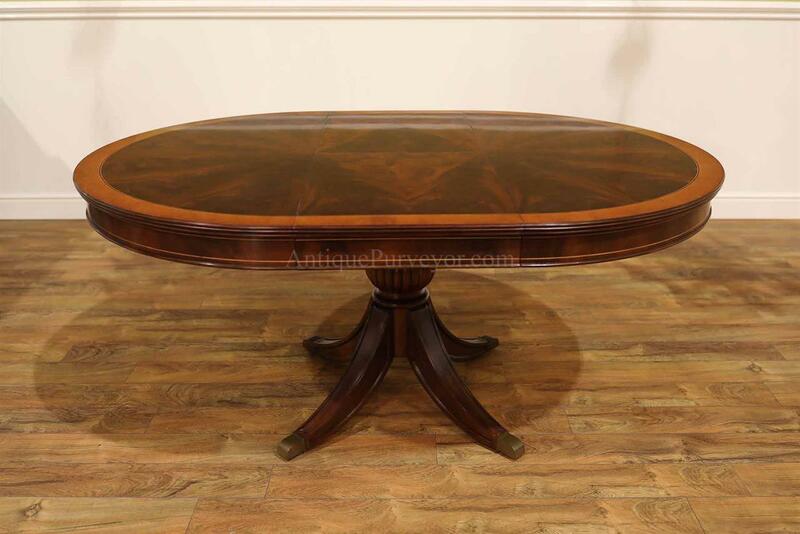 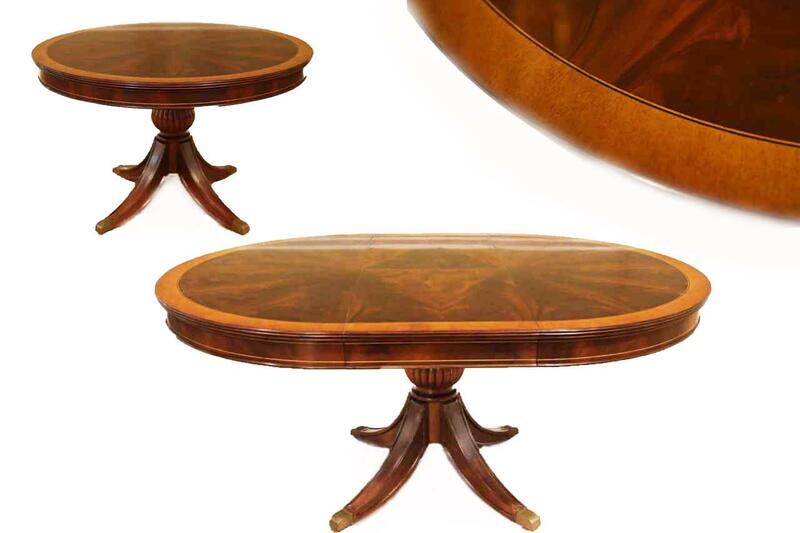 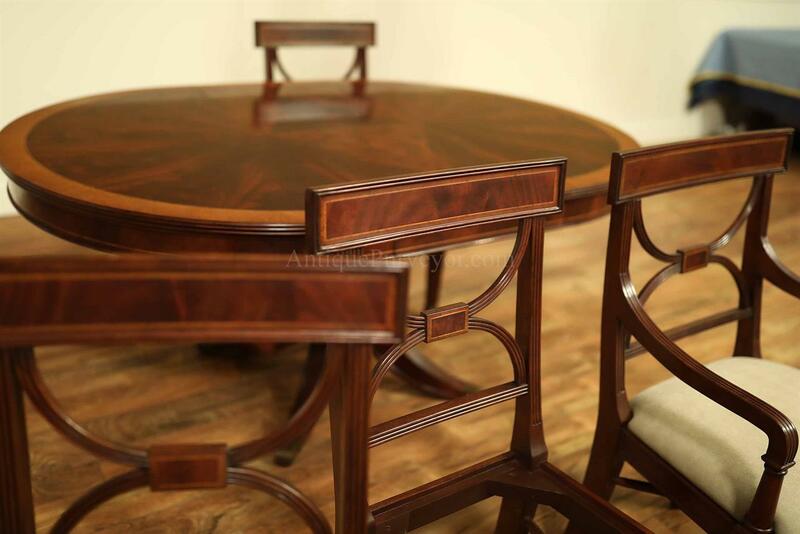 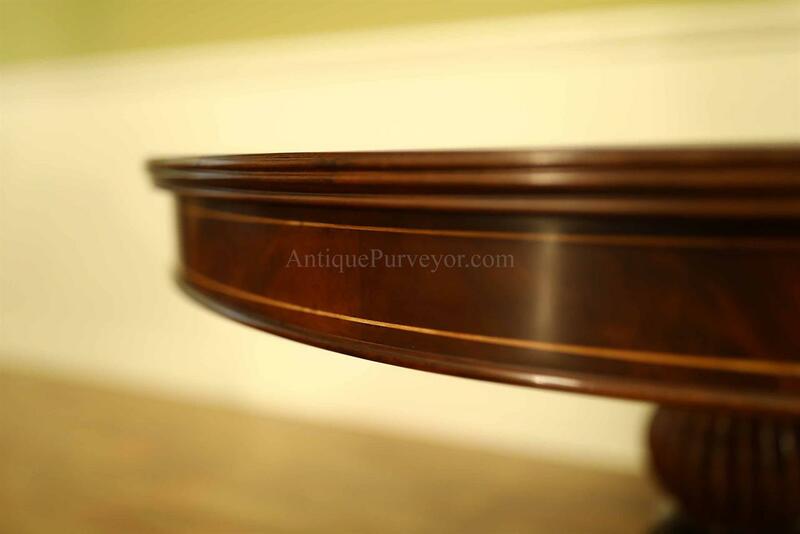 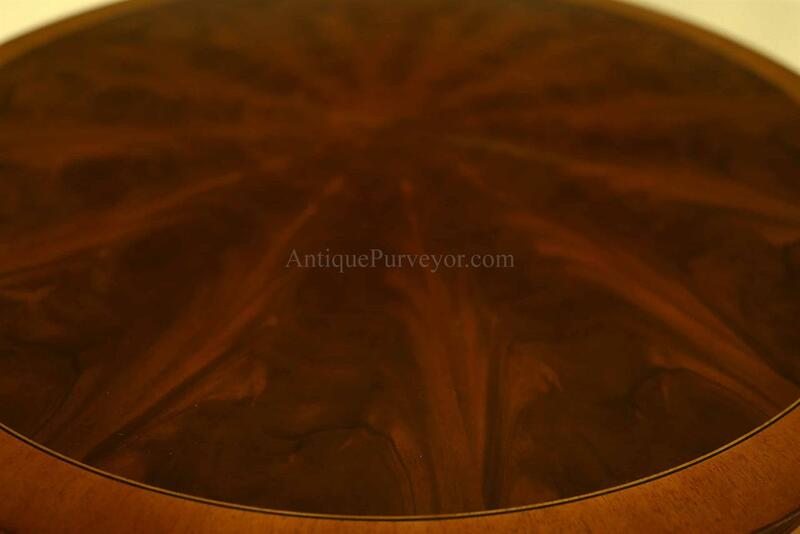 Description: 48 inch round mahogany breakfast table with a self storing leaf. 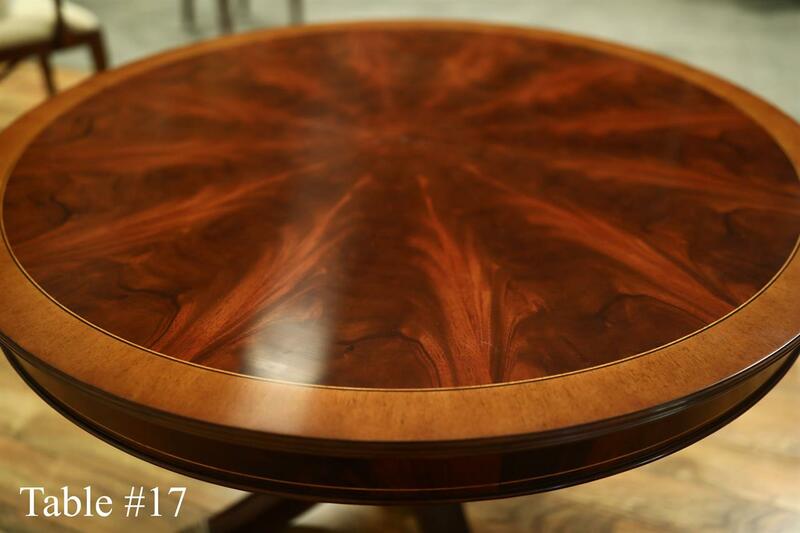 This table is part of our 'Custom Fit Classics' collection. 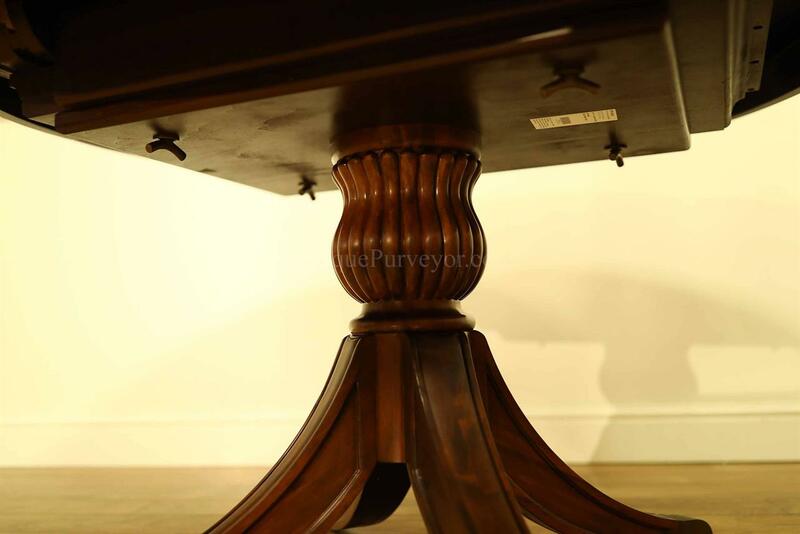 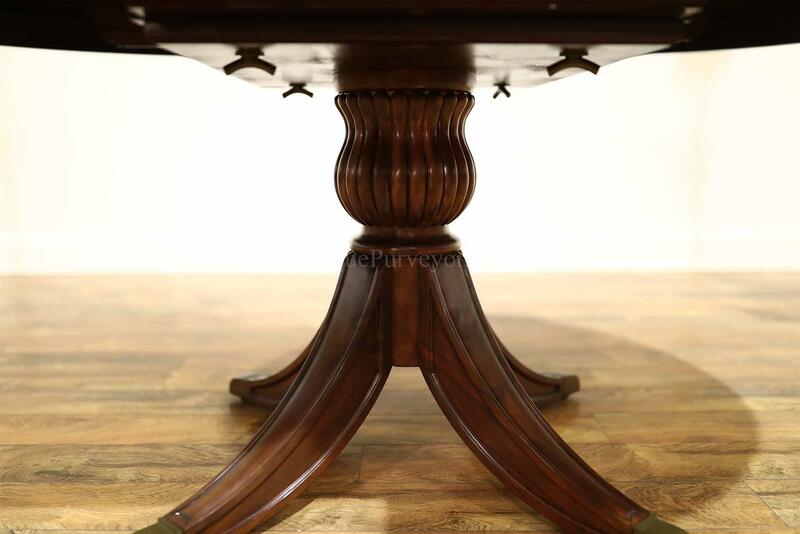 This table features custom solid brass forged hardware, pie-cut mahogany field, satinwood border, inlaid black and white separator and an overbuilt and very sturdy Duncan Phyfe style pedestal with saber legs. 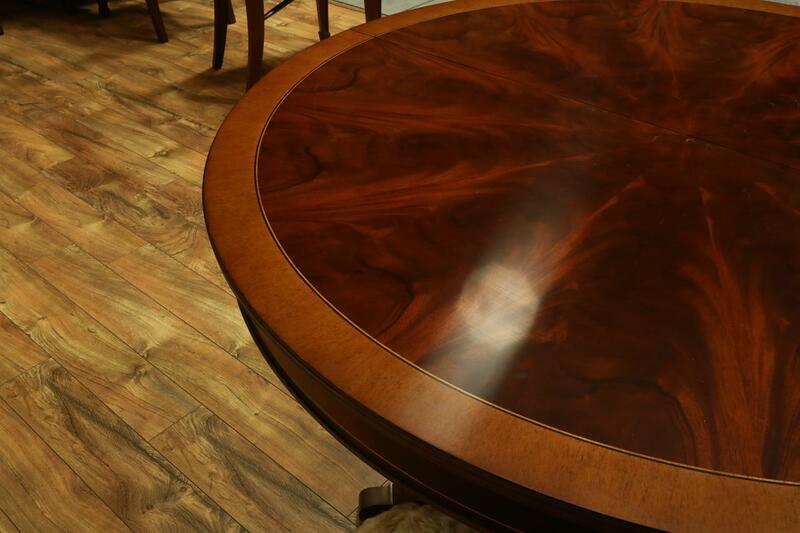 This table was designed from the ground up to satisfy our client base. 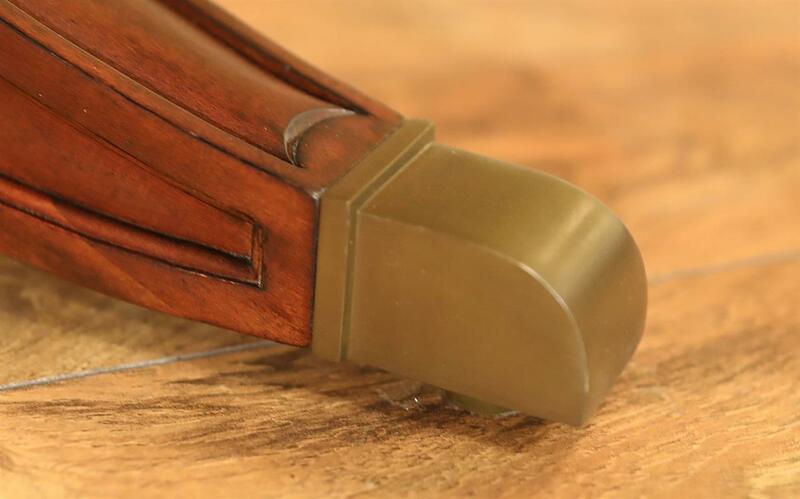 Even the solid tarnished brass foot caps have been designed to meet today's tastes. 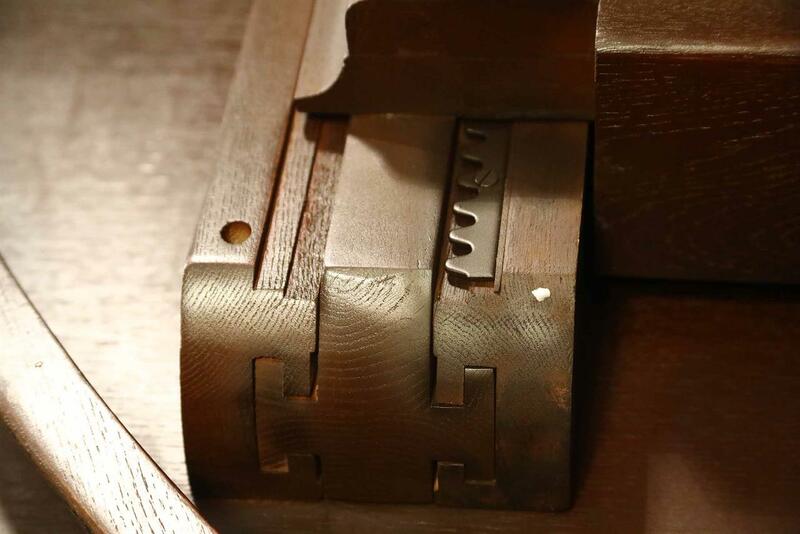 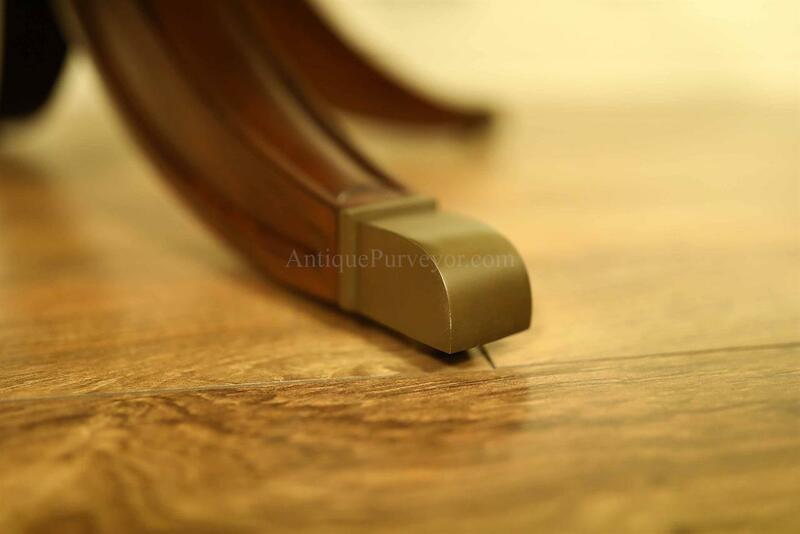 The foot caps and levels, unlike the traditional Duncan Phyfe style feet, are simply classic and they do not resemble a lion's paw which was popular in the 18th century but has recently fallen out of favor. 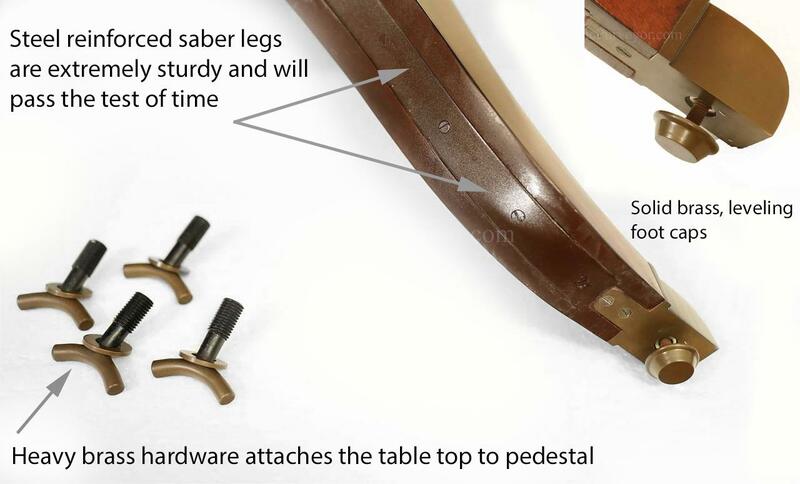 We've also updated the saber legs by embedding custom steel braces from the foot all the way to the column which gives this delicate foot design incredible strength. 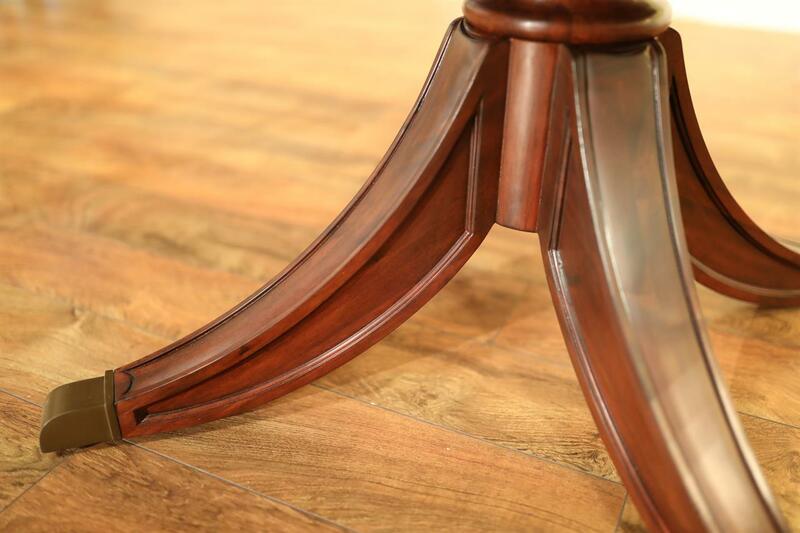 The feet also have durable adjustable levels which are generous enough to accept a large felt pad. 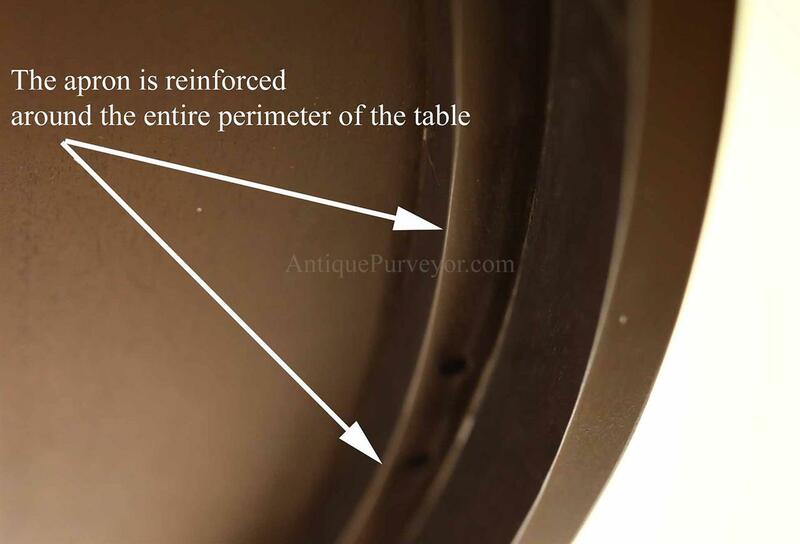 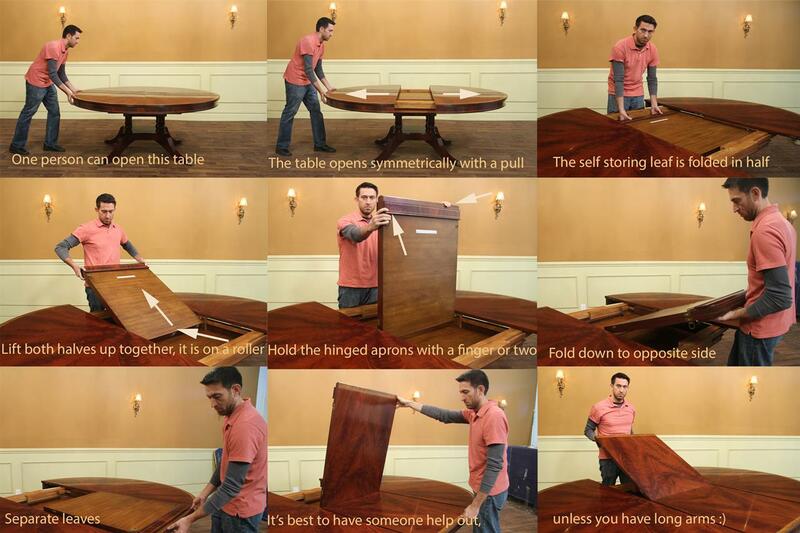 The table is dense, heavy and sturdy. 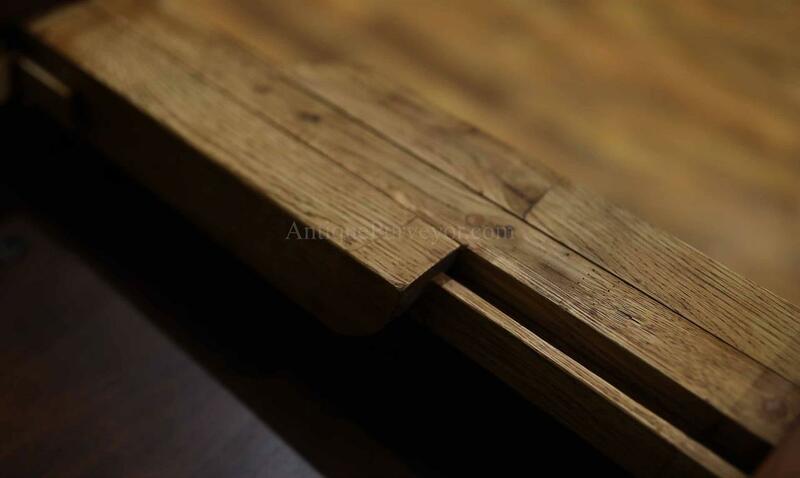 The rack and pinion solid oak table slides are "timed" so when you open and close the table both halves move the same distance. 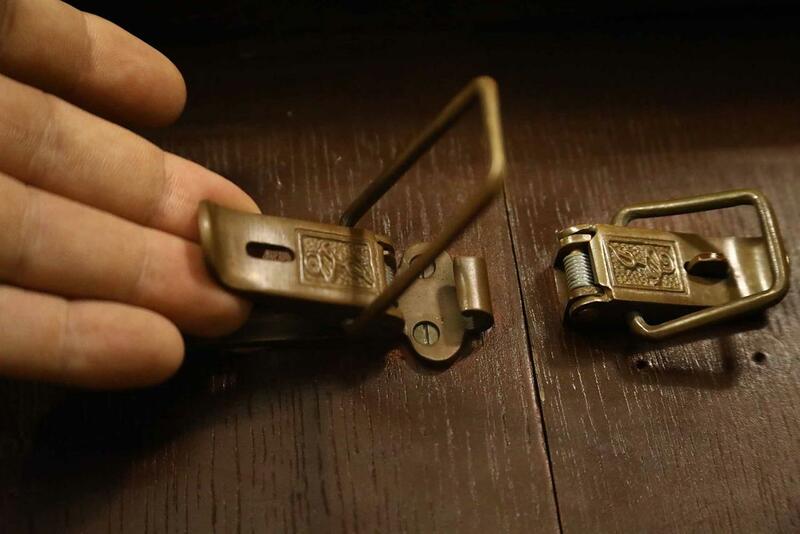 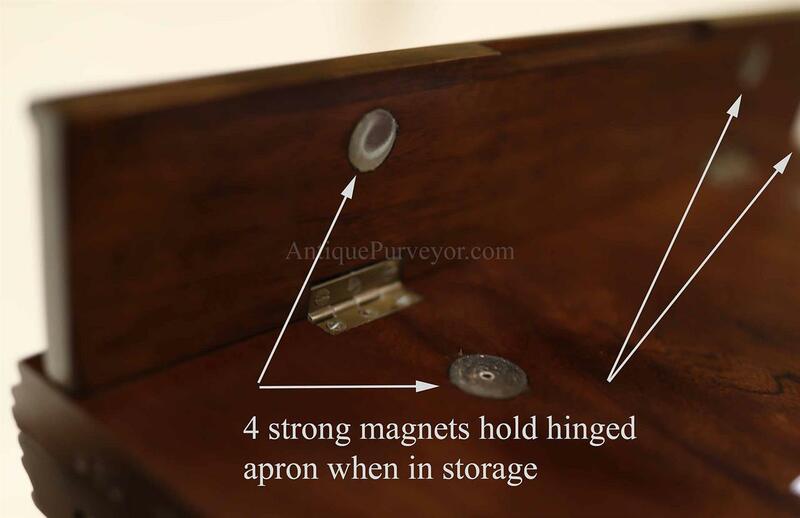 Even the table latches are great quality. 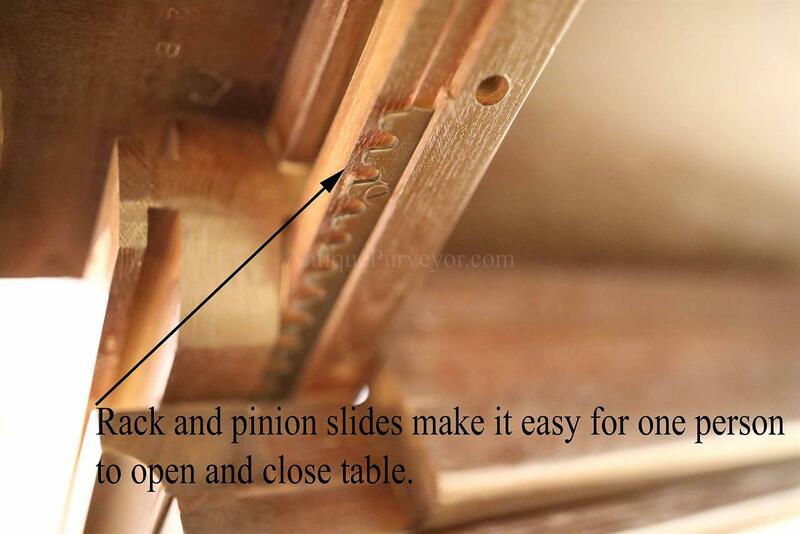 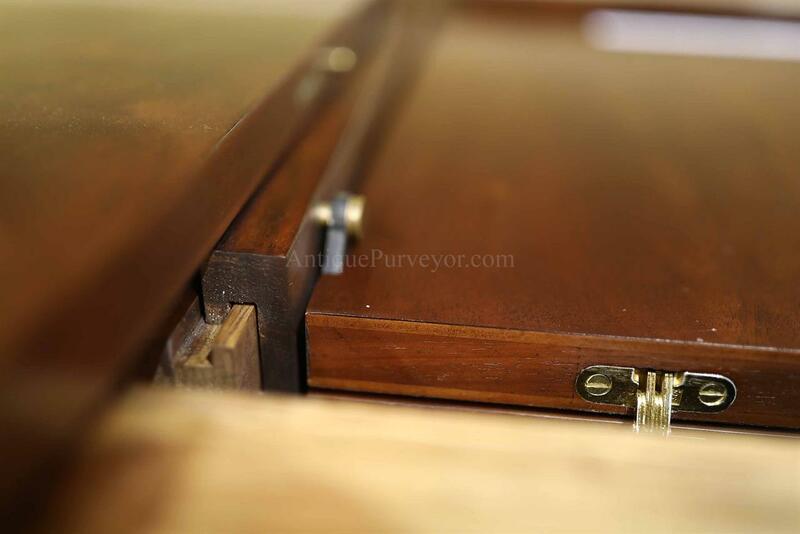 The table and leaf locks have a cam-like action so when you open and close them they hold the table seams tight. 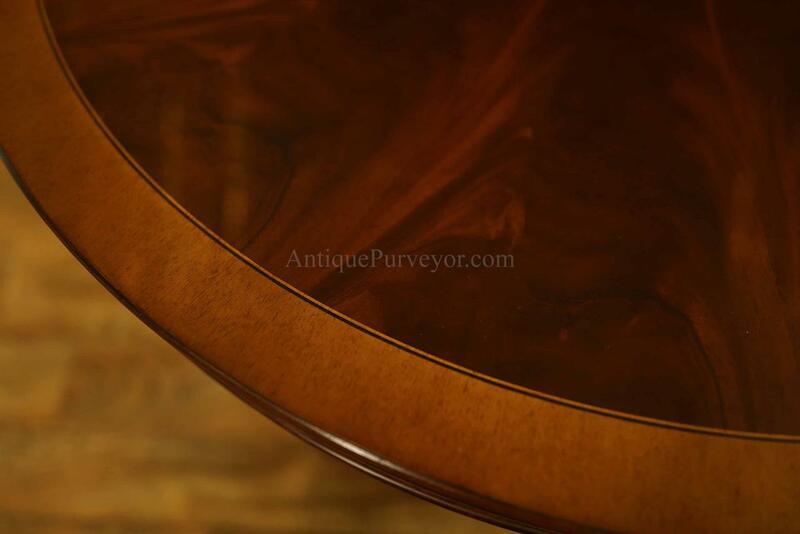 Table is finished with brown mahogany color. 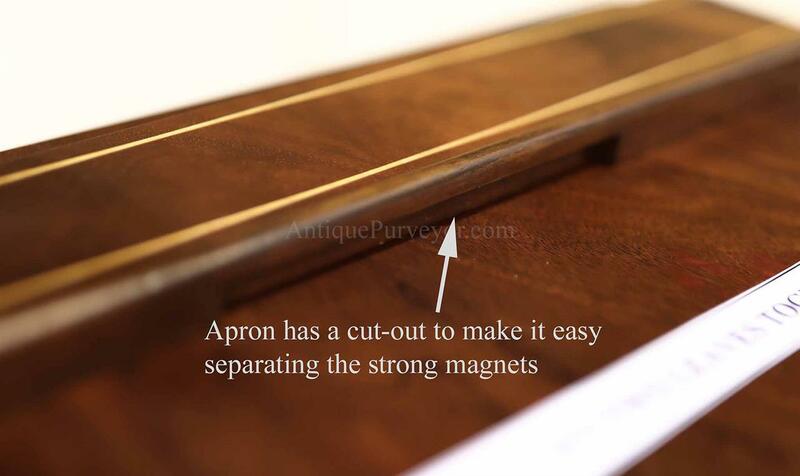 Apron is flame mahogany decorated with two fine satinwood inlays. 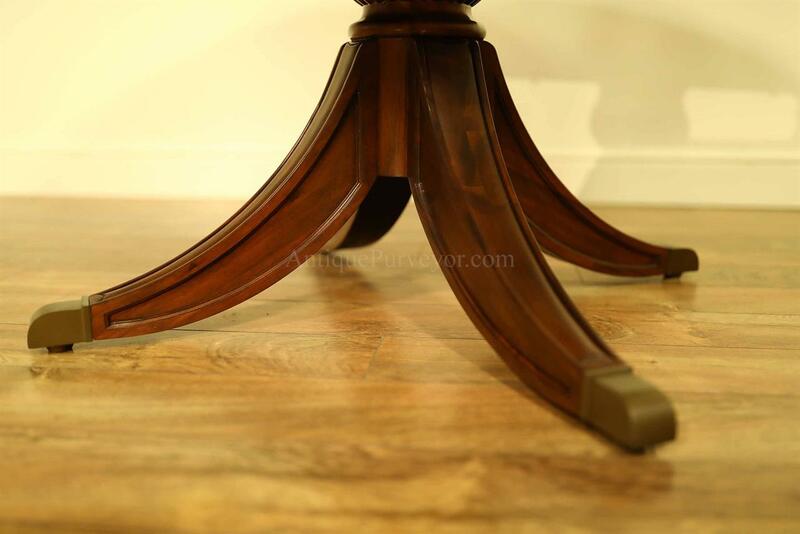 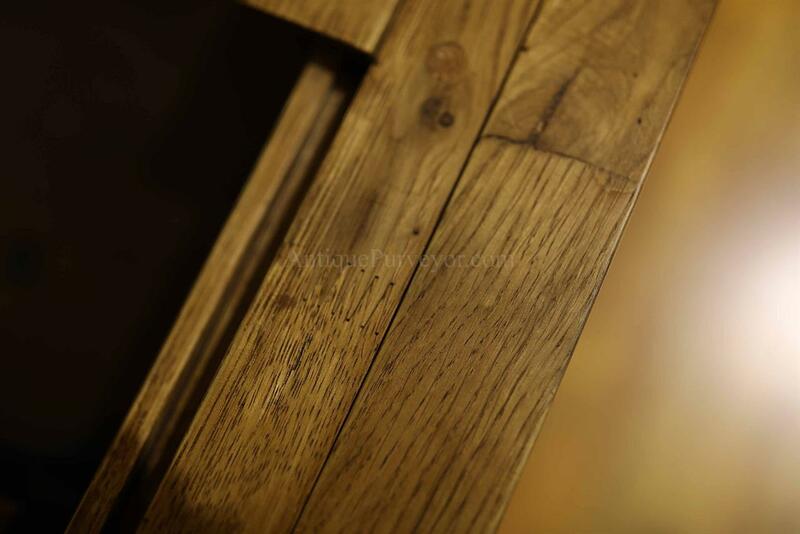 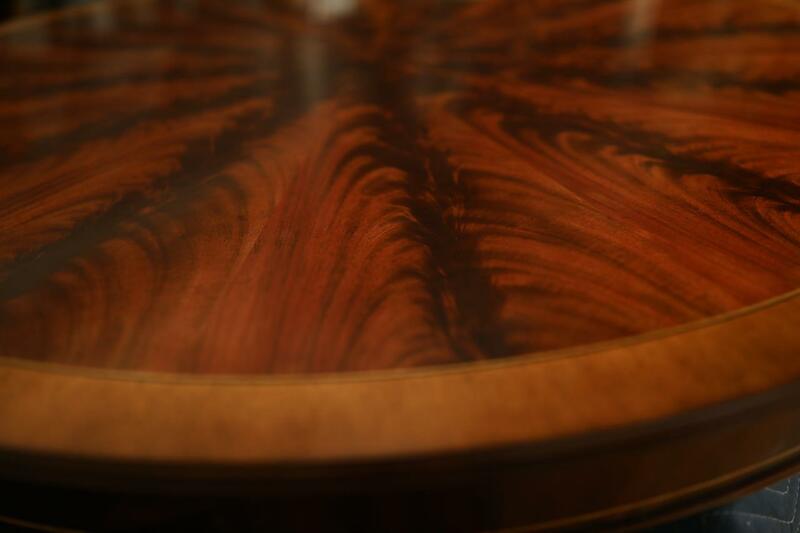 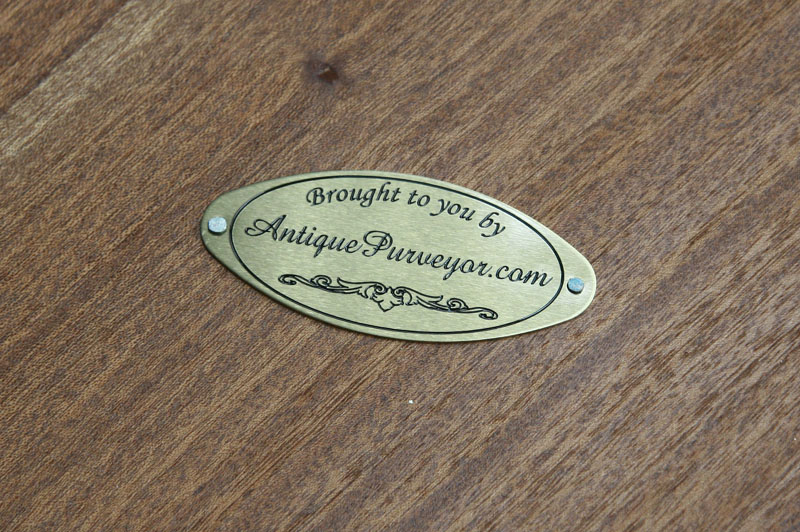 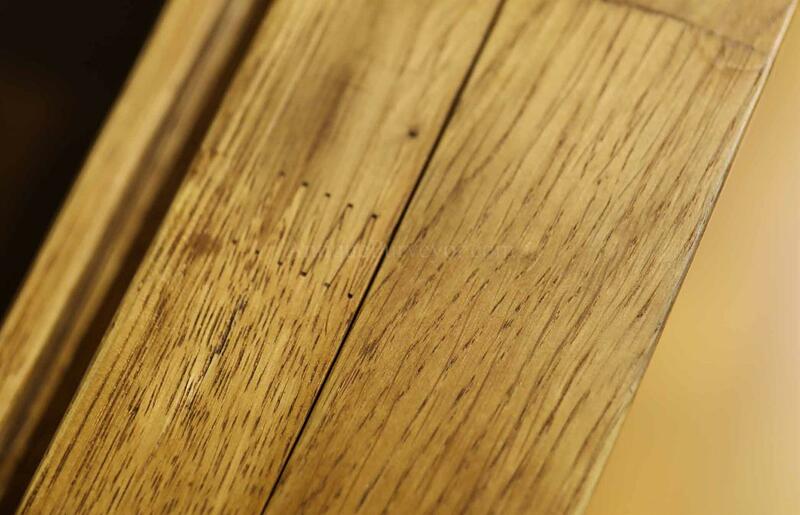 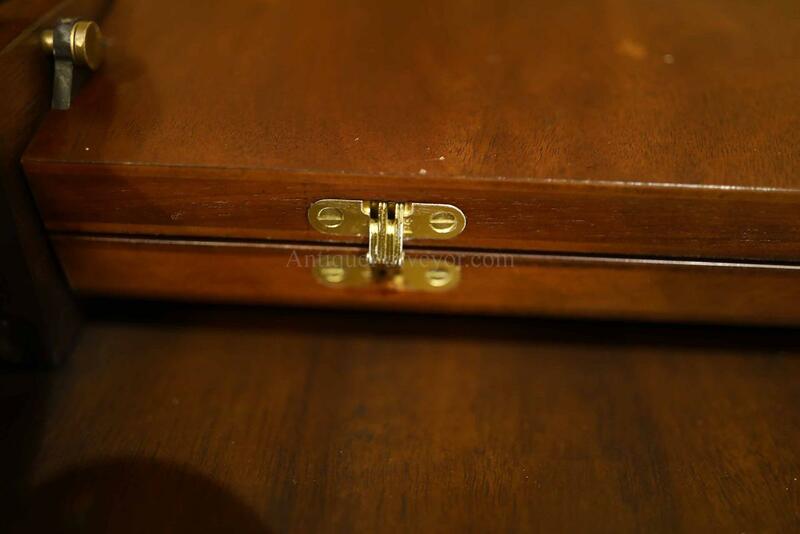 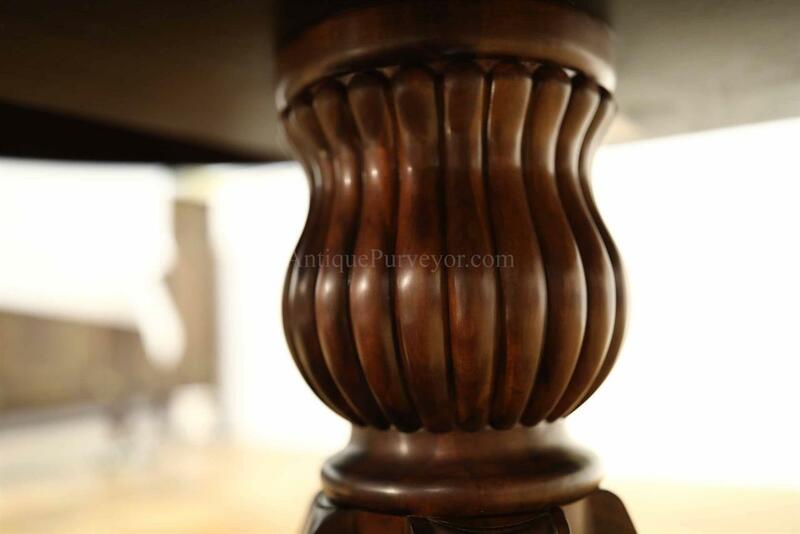 Table has a satin sheen which can be left as-is or it can be buffed out to a more glossy sheen. 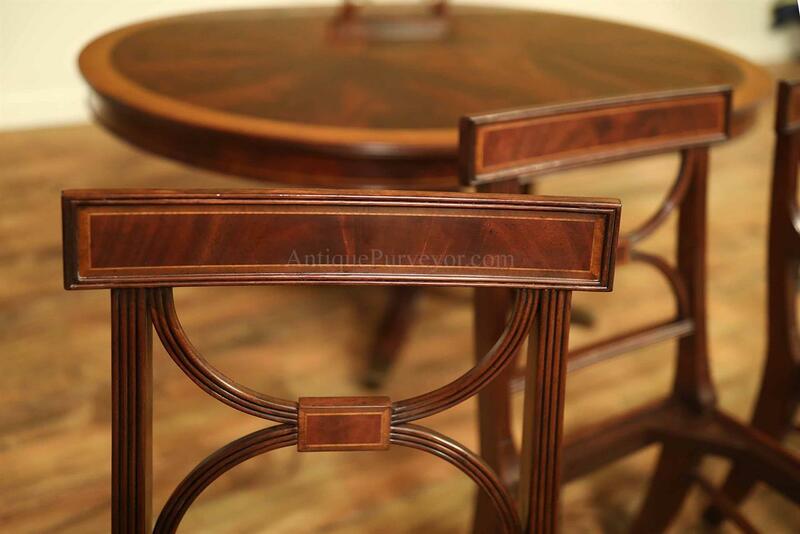 We order these tables direct from the factory so price and value is unbeatable.